The scene in our house Monday night: 4 little kids jumping up & down and screaming. The cause for all this excitement? One sentence…..
Mommy’s going to have a baby. Now you know the REAL reason I haven’t been posting much lately. Run on over to Rocks In My Dryer for some great tips! Place potatoes, onion, garlic & ham in a large stock pot. Cover with water. Cook until potatoes are almost tender. Remove 1 cup of potatoes & mash in bowl with fork. Add some liquid from pot (1 T. at a time) along with flour until you have a thick paste. Add back to pot. Add cheese to soup & let simmer until cheese melts. Stir in milk & add pepper to taste. What is your favorite way to use up a ham? 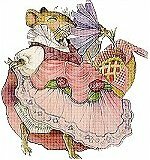 I came across these adorable cross stitch patterns the other day while browsing Jan Brett’s site. If you’ve never visited, take some time to look around at all the treasures on her site. Run on over to Rocks In My Dryer for some great tips.